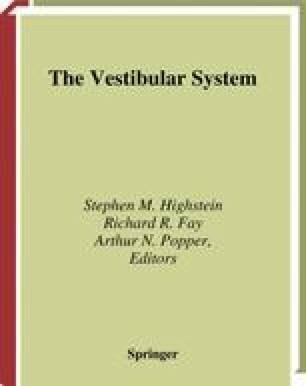 This chapter examined the functional properties and neural substrates of a key vestibulospinal reflex—the vestibular-neck or vestibulocollic reflex (VCR). Functionally, the VCR is a dynamic stabilizing system that shapes head movements, particularly in the critical 1–3 Hz range where the head-neck system exhibits resonant instability. VCR circuits are designed to suppress reflex responses to active, intended head motions, leaving the reflex free to oppose unwanted oscillations or motions induced by external perturbations. A great deal is known about the anatomy and physiology of neurons that comprise the central leg of the important three-neuron VCR reflex arcs. These include both lateral and medial vestibulospinal tract neurons. The latter can be functionally divided into two classes. One carries unmodified signals from semicircular canals to a wide array of motoneurons. Included in this class are the branching vestibulooculocollic neurons. The second class selectively targets small groups of motoneurons and carries a processed canal signal that is presumably designed to control a small synergistic group of muscles. During active gaze shifts, many vestibulooculocollic neurons cease discharging. Vestibulocollic neurons, on the other hand, continue discharging and responding to externally applied head motions while ignoring the canal activation produced by the active head movements. The mechanisms responsible for this behavior are under active investigation. It also remains to be seen how these neurons participate in reflexes generated by activation of otolith receptors.